It was only a short 8 day trip to South Korea but we felt their sincerity, and saw their passion in whatever they did. The people we met were’t always cheerful, or grumpy. They didn’t wear plastic smiles, nor were they snobbish. They were frank, but because of that sincere in whatever they do. I know it seems like a paradox here but you get what I mean right? On our first night in Seoul, we explored the area around hilton and settled dinner at a small family-run restaurant. 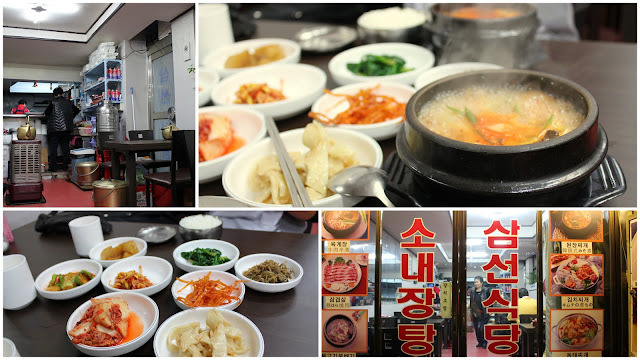 We had a simple spread of banchan and a piping hot stew each. Bean paste stew for me while the friends had spicy beef stew and spicy tofu stew. The place is unpretentious, a bare set-up of tables and chairs, a tiny television and a open kitchen. The ahjummas were pretty amused by us I think, probably thought we looked too young to be wandering around late that night. The food was simple in taste and presentation but comfort food for the soul really. Halfway through the meal a middle-aged man who I presume is their son ambled in with a carton of drinks. He greeted them by bowing (they do this very often as a sign of respect, in fact we found ourselves assimilating this part of their culture very soon because it felt really impolite not to do so after awhile!) and then distributing the drinks to the ahjummas. In no time the restaurant was filled with cheerful voices and laughter, and we the outsiders enjoyed it tremendously. This is an atmosphere you can’t artificially create; it’s spontaneous- it comes from friendship, it comes from family, it comes from love. With this I end my last post for 2011. As we head on to a new year lets cherish all our relationships because they are all very precious. Thank you so much for reading this space for the past year. Cheers to a wonderful 2012! Such a nice and informative blog! *thumbs up! * Anyway, how much did you spent for the whole trip? I’m going to start my 10 days 9 nights trip in Korea soon!